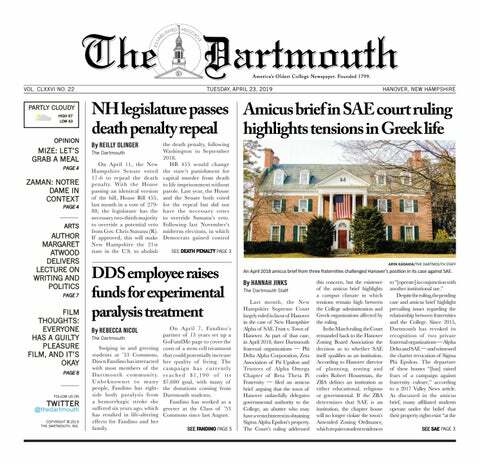 According to Loeb, she saw that the Dartmouth Center for the Advancement of Learning was offering seed money for the development of an experiential learning course. Seeing a “hole in the [Dartmouth] curriculum” for UI/UX, an area that has “growing interest and growing applications to the world,” Loeb said she applied for the grant and, upon receiving funding, solidified the course. The class’s experiential element of working hands-on in the DALI Lab has made it a very popular course, Loeb said. For this year, Loeb said 70 students applied for 20 spots. Loeb said she expanded the enrollment to 28, but could not accommodate all interested students. “We mostly went by [a] first-come, first-serve [basis], but also we [were] looking for students who had thought about design and clearly wanted to understand [design] in a meaningful way,” Loeb said. According to Zirui Hao ’22 and Adam McQuilkin ’22 the class was a perfect fit for them, since it allows them to gain the skills to further develop their website “D-Planner.” Hao said the duo met on their freshman floor this past fall and have been working on creating “D-Planner,” a tool to help Dartmouth students plan courses. The two pitched their project to the DALI Lab and received a partnership to help develop the website as well as a grant from the Magnuson project. According to McQuilkin, “D-Planner” helps keep track of which courses to take to complete a desired major and also acts as a database of past medians for courses. Hao said the two enrolled in Loeb’s class to learn more about user interface and make their website more accessible. “We are both interested in innovation and making things that are out of the ordinary,” Hao said. However, one does not need to be in the midst of creating their own website to find the class useful. “Students can apply this to a human-centered design minor, a digital art minor and to any field of study, because it teaches an approach to understanding people and understanding technology — which is important for lots of different applications and purposes,” Loeb said. The class, while listed in the computer science department, awards an art distributive.